Though they share symptoms, there are some important differences between sleep apnea and snoring. Here, our Surrey dentists explain how you can differentiate between the two. Many people who have sleep apnea don't actually know that they have it; they think they’re just snoring. 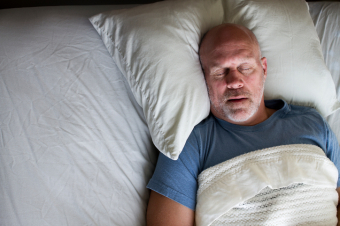 Sleep apnea and snoring do have some things in common: They both involve breathing problems during sleep, they can be related to other health problems, and can disrupt sleep, for example. But there are some important differences between the two. Snoring is essentially vibration in the respiratory structures, which occurs as a result of obstructed air movement during breathing while sleeping. This obstruction is often caused by the uvula, an elongated soft palate, a large tongue, or nasal obstructions. Snoring is one of the symptoms of sleep apnea, but not everyone who has sleep apnea will necessarily snore. Sleep apnea is a disorder characterized by shallow breathing or abnormal breathing pauses during sleep. These pauses or "apneas" can happen as a result of a physical blockage to airflow, lack of respiratory effort, or a combination of the two. Obstructive sleep apnea, the kind caused by a blockage, is the most common. People who suffer from sleep apnea can go for some time being completely unaware that they have a problem; often, it’s the person’s sleep partner who first points it out. People who suffer from sleep apnea often feel fatigued and sleepy during the day. This can negatively impact work performance, general vigilance, and staying motivated in day to day life. The only way to find out for sure if you have sleep apnea is to get assessed by a medical professional. Your doctor or dentist can positively diagnose you, and get you the help you need to achieve a better night’s sleep.